Gorgeous Horseshoe diamond pendant complete with center stone and choker for the western side of life! Feeling lucky? How about this complete gift set with everything you need to please that special lady! Everything seen included for one great price! Included is a 14kt yellow gold horseshoe diamond enhancer pendant, a 16" rope style 14kt yellow choker, and a 1/4 carat cubic zerconia set in a 14kt yellow basket setting. 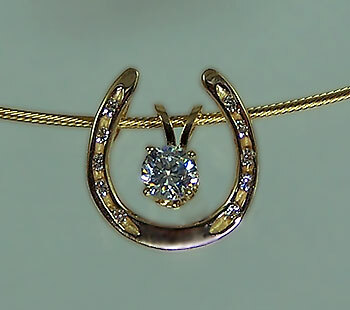 Dimensions on horseshoe diamond pendant: 5/8 inches tall x 5/8 inches wide. Horseshoe is set with .11ct of matching brilliant cut diamonds. Center stone is a 1/4 carat Cubic Zerconia set in 14kt yellow four prong basket setting. Available in 14 kt white or yellow gold. Everything pictured is included in the price. Design your own today with our special request box below!